Want to have a comic book for FREE? Then show up at any Fully Booked store and get a comic book without paying a cent! 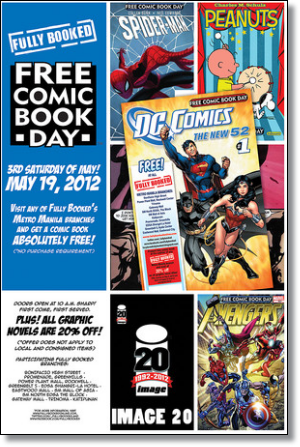 Fully Booked celebrates "Free Comic Book Day" for the fifth time on May 19, 2012. For this year, Fully Booked will distribute an exclusive cover from a DC Comics sample plus other premium items. Cosplayers of favorite Marvel and DC characters will be present to entertain guests and for photo opportunities.